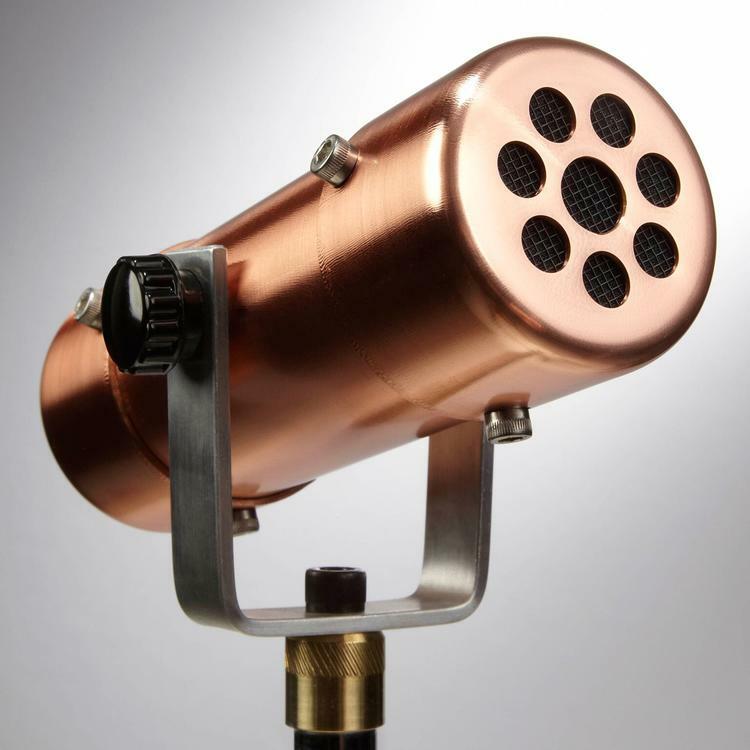 The Copperphone by Placid Audio is a vintage character effect microphone. Unlike full range high fidelity microphones, it operates within a limited bandwidth of frequencies which imparts a compelling nostalgic quality on the signal. Some might compare the sound to an AM radio or an old telephone... The sound is achieved through a combination of the microphone’s element and a mechanical filtering device. The element is rear ported into a hollow resonant chamber and as sound passes through the diaphragm into the chamber, upper midrange frequencies are accentuated while low and high frequencies are reduced. The Copperphone can be used as a stand-alone mic on vocals or any other instrument to create an all-out, attention-grabbing sonic effect. Or it can be used in conjunction with a more traditional mic and the resulting signals can be blended together for subtle character and midrange enhancement.